Draw circle spoke diagrams easily from smart circle spoke shapes and templates with Edraw circle-spoke diagram software. A circle spoke diagram is a diagram meant to illustrate that every spoke is equal in value. Circle-spoke diagrams are used to show the relationships between a single main element and several satellites, such as some students and a teacher. Edraw Max supports more than 200 different diagram types, including circle spoke diagram, flowcharts, network diagrams, database models and so forth. 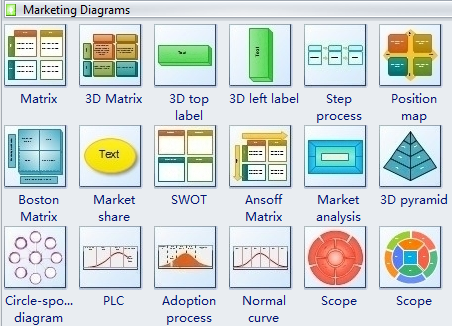 Over 12000 ready-made shapes help to draw professional diagrams, infographics or presentation. It can read and write a number of different vector image formats. Edraw Max is a vector-based diagram software with rich examples and smart shapes for process modeling, benchmarking, simulation and improvement, circle process, path routing, scope and marketing mix, product life and adoption cycles. 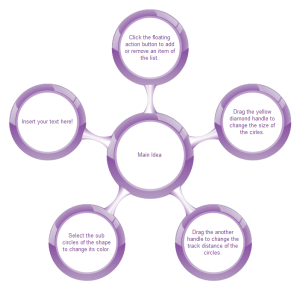 It's easy to create the circle spoke diagrams and modify the circle spokes readily as needed. 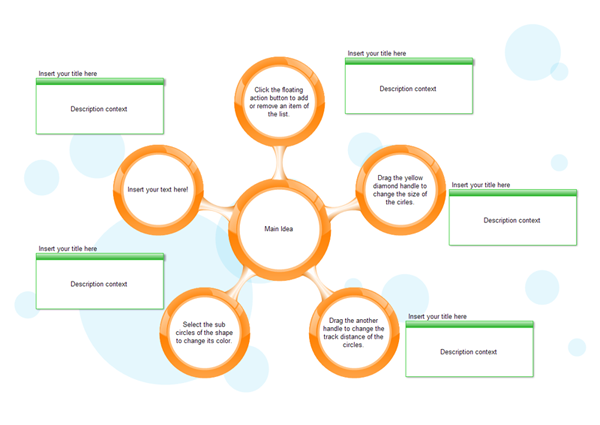 This marketing diagram template helps you draw just about any imaginable chart or graph and in considerable detail. In addition, you have access to various process and list, grid and chart and graph additions. On the Library menu, point to Predefined Libraries, point to Business, and then click Marketing Charts drawing type. 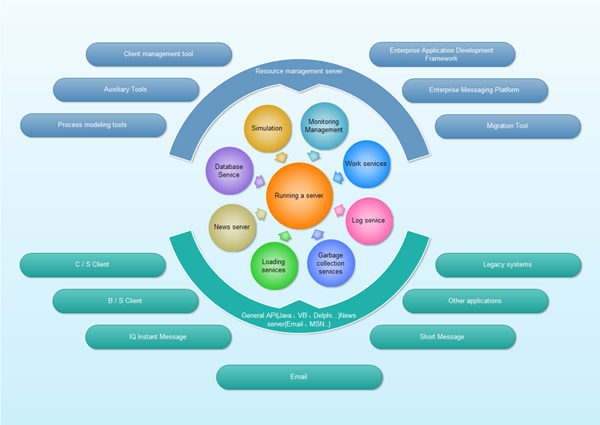 From Marketing Charts, drag a Circle-spoke diagram shape onto the drawing page. Click the action button to change the number of outer circles you want, and then click OK. Tip To add or delete outer circles later, select the circle-spoke diagram, click Set Circle Number, Add a Circle or Delete a Circle option. The designer can scale the blue handle to change the position of circle-spoke diagram as needed. 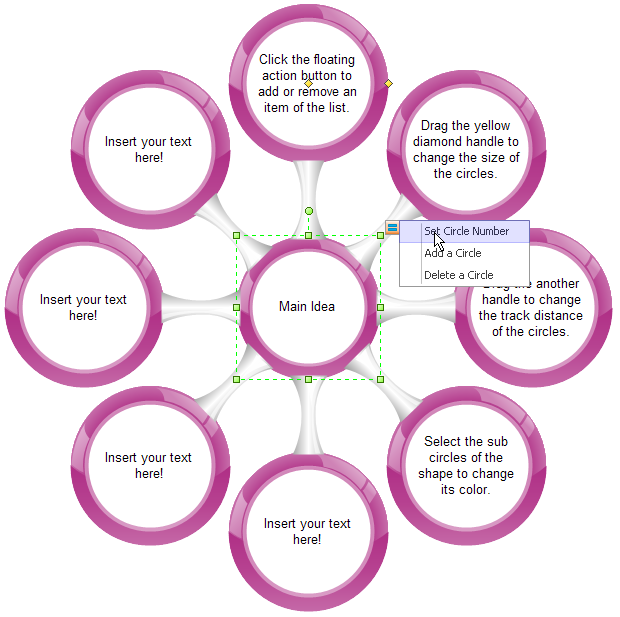 To add text to a circle, select the circle-spoke diagram, click an individual circle and then type. For example, you can add annotations to the circle spoke diagram. Because you can drag shapes in the canvas without a hitch, this particular template is often more flexible than similar charting and graphing in a drawing. The ability to add various diagrams into the chart or graph lets this template well exceed most spreadsheets. Provided is one circle spoke diagram template that is a great helper for your drawing with its automatic generation features.